Fifty years ago this week, Surgeon General Luther Terry released perhaps the most important public health document in U.S. history, the now-famous first Surgeon General’s Report on Smoking and Health. 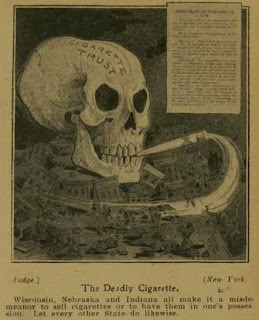 It made explicit and public what virtually every scientist not on the payroll of the tobacco companies knew and acknowledged: that smoking cigarettes was deadly. At the time, cigarettes cost about 35 cents a pack, 42 percent of American adults smoked and people lit up just about everywhere—on airplanes, in restaurants and bars, even in doctor’s waiting rooms. And more than 300,000 Americans were dying of lung cancer and other tobacco-related causes each year. Flash forward 50 years and the landscape has changed dramatically. The percentage of adults who smoke has dropped by more than half, to 19 percent. The average cost of a pack of cigarettes is more than $5.60. And the rate of deaths has dropped dramatically. New research just released in the Journal of the American Medical Association finds that tobacco-control efforts since 1964 kept 8 million people from dying prematurely. The decline in smoking has added 2.3 years to the average lifespan of American men and 1.6 years to the lifespan of American women. If those number sound modest, consider this: Each of the 8 million people spared a premature death because they never smoked, or quit smoking early, gained, on average, almost 20 years of life. The anniversary of the Surgeon General’s report is generating lots of media coverage tracking these changes, trends that are worth celebrating and understanding more deeply. But it’s also important to note that these changes didn’t happen solely as a result of the report itself, or the education efforts that came in its wake. It took policy changes, first small ones in a few places, then bigger ones in more places, to finally produce a groundswell. Editors Note: Following are the five most important lessons. For the rationale behind each of these lessons, go to the Forbes column by Larry Cohen. Lesson 3: Create campaigns that are multifaceted. Lesson 4: Expect and beware of efforts to co-opt. Lesson 5: Keep up the fight (and we’ve only just begun).